Here is the BBC’s report of the Scottish Parliament’s deliberations on the matter. The Scottish Parliament has investigated the BBC’s readiness….made more difficult because the BBC refused to provide anyone to talk to them until Lord Patten was contacted and who then promised to ensure the BBC would provide suitable spokesmen. To summarise, 2014 will be a challenging year for BBC Scotland in respect of the coverage of major events. As the parliamentary committee charged with consideration of broadcasting in Scotland, we wish to ensure that it has the necessary capacity to do this effectively. Indeed, on 22 January 2013, Mr MacQuarrie stated: ―We welcome the challenge and scrutiny from the committee. It is therefore a matter of considerable regret that BBC Scotland initially declined our invitations to give oral evidence. It is unfortunate that contradictory evidence has been provided to us in terms of staffing numbers and the effect of DQF. There is nothing we can do to substantiate claims by either party other than to continue to monitor effects on programming output and quality. We would be extremely concerned if anyone has deliberately set out to mislead a parliamentary committee. 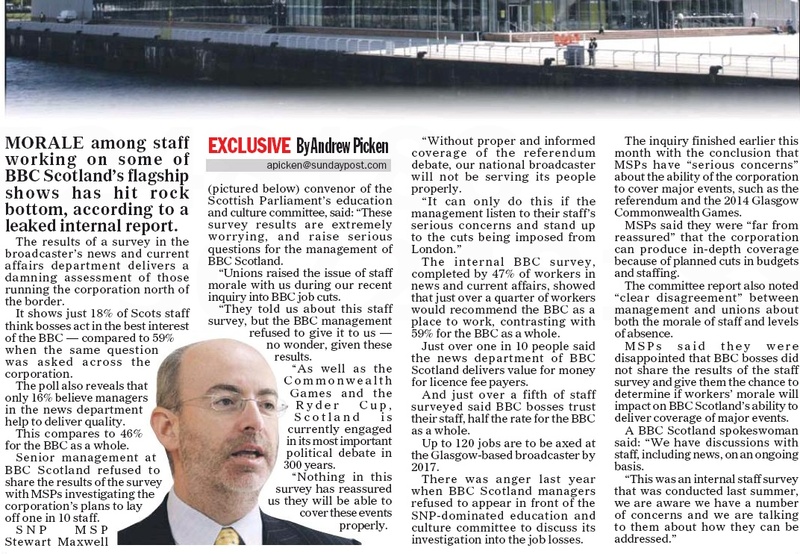 The reason for the questions raised about the BBC’s ability to cover these events is that jobs are being cut at BBC Scotland as budget cuts are implemented….the number of jobs being lost, mostly from news and current affairs, is 17. This raises another question….was the BBC’s move to Salford the best use of resources or was it simply shuffling the chairs around a bit whilst not actually improving the service? Could that money have been more effective spread around all the regions not just Salford? The Salford move doesn’t save the BBC money…it costs it money…..an extra £120 million over and above the cost of carrying on as before the move over the period until 2030. The actual cost of the move is said to be £224 million…..if they hadn’t moved…that would have been £224 million that could have gone on all the other regions to improve their services…instead it has been spent on a cosmetic, ‘politically’ inspired move. The BBC says its intent was to spread its ‘spend’ more evenly across the UK and to increase economic investment in the region….and yet it cuts services in Scotland at a time when there are going to be major news stories occurring there…whilst now, as mentioned, overspending on the move to Salford….a move which is purely ‘political’ rather than done on a genuine business case….more about ‘soul’ than efficiency and improving the service. Does Salford do anything that, had they stayed in London, or Oxford Road, could not have been done equally well or better? There is nothing specifically ‘Northern’ about the services that moved there…they could just as well have remained in London….BBC Breakfast, children’s, 5Live, sports and Future Media and Technology. There are encouraging signs that the anticipated benefits of the move are beginning to be realised. The BBC’s relative share of overall television viewing and reach to BBC radio in the north-west has increased when compared to the UK average, more collaborative and flexible ways of working have been introduced, some efficiency savings have been delivered and there has been significant economic investment in the region. Really? I would be interested to know how a move to Salford increased audience share…how is the one influenced by the other? Do you listen to 5Live more because it comes from Salford? Most of the BBC’s decision-making and spending has been historically concentrated in London. To help address this imbalance, the BBC developed plans in　2004 to relocate a number of its departments to a new regional centre in the north of England. The BBC’s objectives for moving to Salford are to:• better serve audiences in the north;• improve the quality of content for audiences across the UK;• improve efficiency using new technology and ways of working; and• provide economic and other benefits to the region, including up to 15,000 jobs. However the BBC said the move would actually cost them more money than had they kept their operations as they stood….. The BBC calculated that moving to Salford could increase the net cost of its estate by up to £120 million (after discounting future cash flows to their present value) over the period to 2030 compared to alternative options. However, it　concluded the move would still be value for money owing to the wider benefits of: helping to better serve audiences in the north; increasing the quality of its content and using new technology and ways of　working;　and providing economic and other benefits to the region. Increasing the total BBC spend in the region; the number of people working in the media sector in the region; BBC spend with northern independent production companies; and gross value added to the region, which is a way of measuring the economic impact on the region of the BBC’s move to Salford. How many jobs are at Salford? At the same time, hard-pressed residents are furious over claims by BBC bosses — including former director-general Mark Thompson, who conceived the ludicrous scheme — that the venture would create 15,000 new jobs for local people. In fact, unemployment in the area has risen. The BBC has a total 9.7% of its staff from ethnic backgrounds and 3.7% who are disabled…it is unknown how many climate change sceptics they employ. 11 staff received over £100,000 to move….322 received over £20,000.…123 of those receiving £50-60,000…a few receiving £150,000 or more. The BBC estimates that the final cost of fitting out the buildings at Salford and moving people in will be £224 million, which is £9 million less than the revised budget approved by the BBC Trust in February 2011. Will it prove to be efficient? Although the BBC has completed the transfer to Salford, it is too early to judge whether it will deliver value for money. This will depend on the BBC’s ability to achieve a　sustained improvement in audience approval in the north, embed new ways of working to achieve efficiencies of £151 million and provide sustainable economic benefits for the region. The BBC has developed an appropriate approach to measuring the future impacts of the move but has not yet set out clearly how it intends to make all of its planned efficiency savings. One problem might be that when the BBC calculated their efficiency savings they included the sale proceeds of their Oxford Road premises in Manchester from which they expected to receive £19.6 million but actually only got £10.3 million….and that they predicted that they would make efficiency savings of £128 million over a period to 2030…but the actual savings are going to be half that…only £61.4 million. It was a good thing they moved part of the BBC out of London, after all, London is not representative of Britain, just as Paris isn’t France and New York isn’t America. It’s called the British not the London Broadcasting corporation and the 2011 Census results tell us that London isn’t English anymore. The BBC metropolitan Stephen Fry types detest Britain, too white, too boring and well, racist. They should have moved the entire BBC outfit to Belfast, surrounded by Ulster Unionist Protestant Orange men free masons who love the Queen and Britain. Can you imagine the discomfort of the BBC luvies, it would have been a cultural shock for them, their worst nightmare. Increasingly few places are, that’s the problem. It’s a canard that the move to Manchester – sorry, ‘Salford’ – was done to decentralize the BBC’s broadcasting operation. Media City’s a 2 minute taxi ride from the train terminal that links London and Manchester via one of the fastest train journeys in the country. I dare say it’s quicker to get to Manchester from the Watford stop than it is to make the journey from central London to whichever fashionable suburb these BBC producers and presenters currently live in, therefore negating the need for changing many of the staff already in place down south. The move was done purely as a way to launder tax-payer money into the pockets of suitably connected executives and hangers-on. Or to put it another way: it was legalized theft. The question is how many of the supposed costs of the move were actually down to the BBC pandering to its staff’s Northophobia? I’m pretty sure that soldiers have to move about in their career too, but the Army won’t pay for them to fly from, say, Leeds to Ulster each day. Nothing argues for the move more than the fact so many members of our national broadcaster act like being asked to move from one part of Britain to another is the same as serving on an Artic convoy. Surely the reluctance of many BBC staff to move to Salford offers the corporation an excellent chance to renew its staff by sacking those who won’t move, as would happen in the private sector, and employing some fresh blood. No massive pay offs of course. Also it is vital that they don’t employ the about to be made redundant staff from the Guardian, despite its roots being Manchester. Nor should they employ even more of their chums from the Labour party machine. Surely the BBC has a duty to ensure that it employs a representative cross section of people and thus ensure that its staff have a range of views that more or less represent the views of the population as a whole. Of course we all know a) that they won’t sack anyone b) that they will keep on paying license fee payers money for the crazy commute c) that they won’t employ a typical cross section of folks with a wide range of views d) that they will keep on recruiting more and more liberal/left folks e) that they don’t care what ordinary people think because they are gently leading us to a liberal left utopia even if we don’t want to go!